Product information "DD ExpandIO Internal - 6x PCIe Gen 2.0 Expander / Backplane including 2x 50cm Dataport cable"
With the PCIe Expander you can expand an x8 PCIe slot to up to six PCIe slots. The bandwidth of the PCIe host is distributed to the six new PCIe slots with 20 GBit RX and 20GBit TX. The PCIe backplane has two PCIe x4 slots and four PCIe x1 slots. The provision of the expanded PCIe slot is operating system independent, so all popular operating systems such as Microsoft Windows®, Linux (from kernel 2.6.34), OS X / MacOS, etc. can be used. The expansion of the PCIe slot is not limited to Digital Devices hardware, but PCIe slot cards from any manufacturer can be used. For the use of Digital Devices hardware, the construction of high-density streaming servers or IP head stations is now possible without the purchase of expensive motherboards, which to have a large number of PCIe slots for as many tuners. With our Max series, which already provides you with 8 tuners per card, you can expand a single PCIe slot for up to 48 tuners. The backplane is designed for installation in the 5.25" frame of a computer housing, so that over 3x 5.25" slots also PCIe slot cards in full height can be installed in the backplane housing. The communication between the host controller and the backplane is made via two included 50cm Dataport cables and ensures a stable transmission. The cable length can be changed variably. To power supply the PCIe backplane and the expanded PCIe slots, the necessary power is provided via a SATA connection directly from the ATX power supply for 3.3V / 1A per slot. For 12V consumers, the supply current depends on the power supply. The backplane also has separate fan connections to generate sufficient cooling. The host controller is PCIe GEN3 compliant and requires no power from the power supply. Note: This article is a set of host controllers and backplane designed for internal cabling via the host controller. In the internal version of this article, the Dataport cables are routed inside the PC for connection to the backplane. 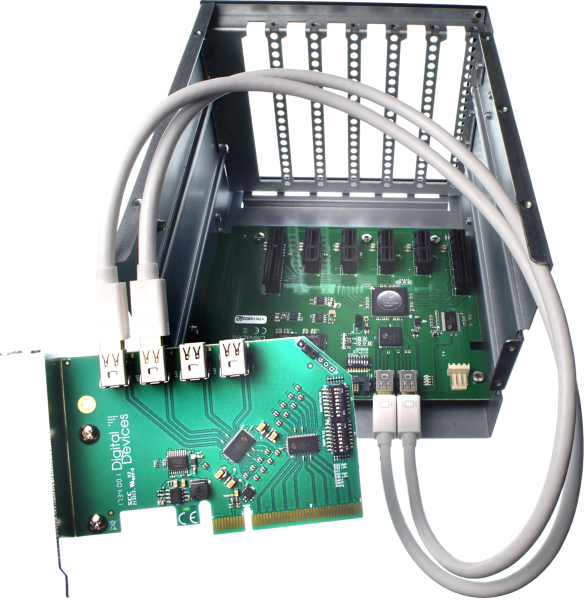 Related links to "DD ExpandIO Internal - 6x PCIe Gen 2.0 Expander / Backplane including 2x 50cm Dataport cable"
The Digital Devices Backplanes transparently extend a PCIe host with an internal unit. The connection is made via a PCIe host controller via up to four data cables. power adapter | SATA to 2x 3,5"
Power adapter | 5,25" to 2x 3,5"